The SpotRemover Cydia tweak is a surprisingly useful tweak if you are looking to completely remove the iOS Spotlight page from the SpringBoard. For me personally I notice my SpringBoard (homescreen) seemed a lot more responsive after installing the tweak. As I rarely ever use the iOS Spotlight I actually think I am going to keep it installed for the time being. You can find SpotRemover through the BigBoss repo for FREE. The NowListening Cydia tweak allows you to always be one tap away from the stock iOS Music.app. You see, once installed the tweak will add an iOS 5 styled notification banner across the top of your iPhone, iPod Touch or iPad’s screen displaying a currently playing song. If you tap this banner you will automatically be taken to the Music.app. If you are interested in the NowListening Cydia tweak you can find it through the BigBoss repo for FREE. 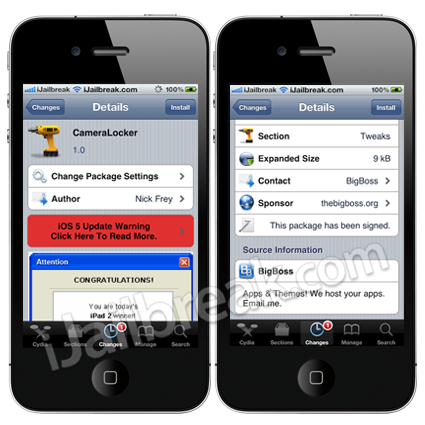 Personally I was not able to get this tweak working on the iOS 5 firmware, however, let us know your thoughts below. Are you someone who is constantly listening to music on your iPhone, iPod Touch or iPad? Would you like a quick way to instantly start playing your library of songs straight from the lockscreen? 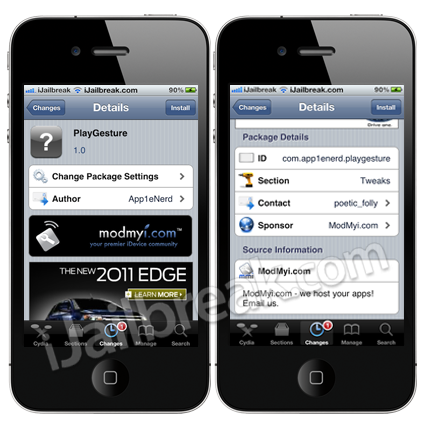 Introducing the PlayGesture Cydia tweak! The tweak will allow you to instantly start playing a song from your music library with a single swipe down the lockscreen. While it is a very simple tweak, it is also a very useful tweak for all of you music lovers who are looking for a quick way to start playing their music. 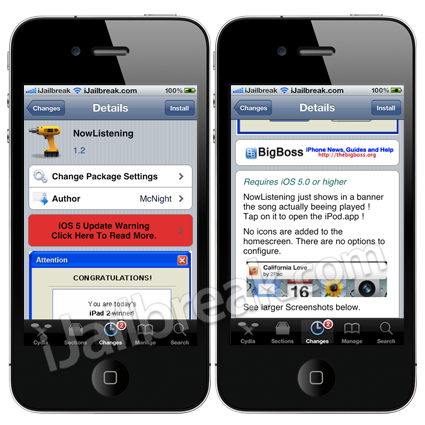 You can find PlayGesture through the BigBoss repo for free. Would you prefer if the Camera shortcut always appeared next to the Slide To Unlock bar? If you answered yes, you will be glad to know that with the CameraLocker Cydia tweak you can make it so the Camera shortcut always appears next to the Slide To Unlock bar. The tweak will be useful if you are someone who is constantly snapping pictures throughout the day. If you would like to change the shortcut that appears next to the Slide To Unlock bar you will want to check out the AnyLockApp tweak. You can find CameraLocker through the BigBoss repo for free. However, this completely disable Spotlight, if you simply want to get rid of the shortcut I’d recommend installing Activator (completely free as far as I know and works flawlessly on iOS 5) and adding a different shortcut to the single-press home, this negates the Spotlight shortcut. Really quite useful and the only way I can see to get around it. how to disable search in iphone 5 ! are you have a tweak ?